There’s a lot to like about The Wind. First off, the cast: Meg Foster is a hugely underrated actress and she does a great job here. She’s the ideal focal point for a creepy tale like this and she anchors the film well. Robert Morley was also a good get for the cast and you have to love his “wacky landlord” role. Steve Railsback is pretty restrained this time around and seems a bit confused, but maybe that was his character. McCallum doesn’t do all that much. Last but not least is the one and only Wings Hauser, who with his mustache (a rarity for him) and his strange, menacing affect, plays the ideal antagonist. But that’s the HUMAN cast. The Wind is a character unto itself in this film. It’s at least as scary as Phil, it gets angry, it comes and goes, and accentuates things. You have to expect a movie called The Wind will have plenty of actual wind, and there’s no shortage of it. The seaside village has a character of its own as well, as does the house Sian is renting. If it’s one thing Mastorakis delivers this time around, it’s atmosphere. Take the Greek locations and quality cinematography, and enrich it with a Hans Zimmer score, and you mostly have a winner. Mostly because there are some flaws, naturally, as well: In his mad quest to make a giallo-type movie and try to outdo Dario Argento at his own game, most of the motivations for the characters are unclear. And while that also may be true for many giallos, it doesn’t matter quite as much because the Italians pack in so much weirdness and visual verve, it doesn’t matter. Technically this isn’t a giallo, so it does still matter, and because of the lack of polish on the characters, the movie starts to drag right before the climax. Still, for an “Old Dark House” thriller-horror, with Meg Foster home alone and Wings brandishing a scythe (! ), The Wind is worth seeing. Interestingly, director Mastorakis directed Wings again the following year after this in Nightmare At Noon (1988), and at one point in The Wind, Meg Foster uses the phrase “nightmare at noon”. Something about these three words must intrigue Mastorakis. 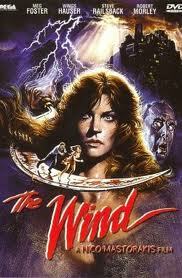 Released on the fan-favorite VHS label Lightning Video, The Wind is at the very least a one-time watch. I have to try watch this film. I seen Nico's previous film Blind Date which is cheesy in places but fun the effects are dated but I reckon Blind Date can be remade. The Wind has some good moments and it is worth seeing! Good review. Bloodstone is also another Nico Mastorakis flick you should try to track down. Thanks! Will have to check that one out, appreciate the recommendation. you guys on a horror kick now? Love meg foster! she's got those killer blue eyes! I think I've seen this on cable years ago, but I don't remember liking it much. We do have some more horror-oriented stuff coming soon.